WHOM SHALL I SEND? HERE I AM, SEND ME - This Sunday's readings serve to focus our attention on the sinful person, reluctant and afraid, but called by God none the less. For it is by and through God's grace that we may serve. 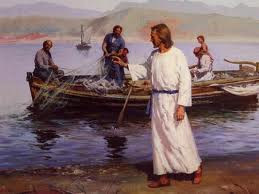 Today's Gospel (Luke 4:21-30) is the call of Simon, the fisherman. Simon's response,"depart from me, Lord, for I am a sinful man" is understandably human. they left everything and followed him." In our first reading (Isaiah 6:1-2a, 3-8), we hear the same lament at the moment of Isaiah's calling, "Wow is me, I am doomed! For I am a man of unclean lips." And yet, but the grace of God, Isaiah is made clean. 'Here I am," I said; "send me!'" In our Epistle reading (1 Corinthians 15:1-11), Saint Paul reminded his beloved community of the truths of the Gospel he had preached to them, and of the tremendous grace by which he, "born abnormally", had been chosen by God to preach and to serve. "I am reminding you, brothers and sisters, of the gospel I preached to you, which you indeed received and in which you also stand. Through it you are also being saved, if you hold fast to the word I preached to you, unless you believed in vain. For I handed on to you as of first importance what I also received: that Christ died for our sins in accordance with the Scriptures; that he was buried; that he was raised on the third day in accordance with the Scriptures; that he appeared to Cephas, then to the Twelve. "After that, Christ appeared to more than five hundred brothers at once, most of whom are still living, though some have fallen asleep. After that he appeared to James, then to all the apostles. Last of all, as to one born abnormally, he appeared to me. For I am the least of the apostles, not fit to be called an apostle, because I persecuted the church of God. But by the grace of God I am what I am, and his grace to me has not been ineffective. Indeed, I have toiled harder than all of them; not I, however, but the grace of God that is with me. Therefore, whether it be I or they, so we preach and so you believed." Would you suppose that the practice of God calling sinful people had ended two thousand years ago? Not at all. As we have heard in Paul's letters over the past few weeks, there are many gifts of the Spirit and many ways in which we are called to serve God. Perhaps we should take a moment to reflect on how God is calling each of us. And perhaps remember the times we ignored the call because in our on way, we said, "Master, depart from me for I am a sinful person". To which, Jesus responds, "Do not be afraid. From now on you will be catching men." May we have the grace to hear God's call and, like Isaiah, say "Here I am, send me".